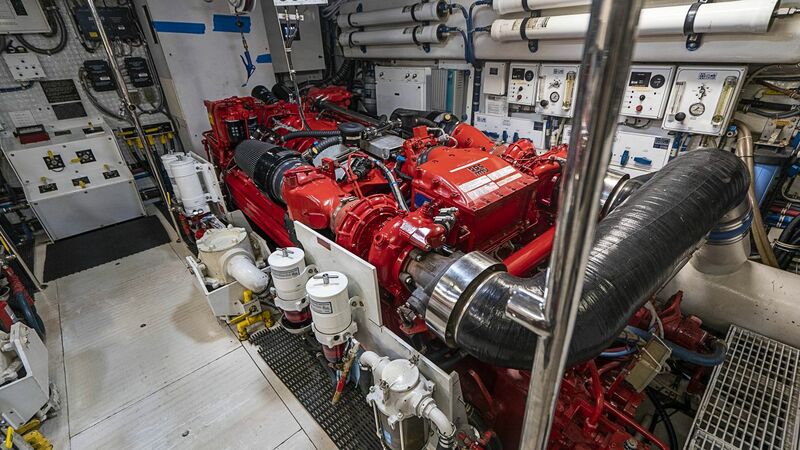 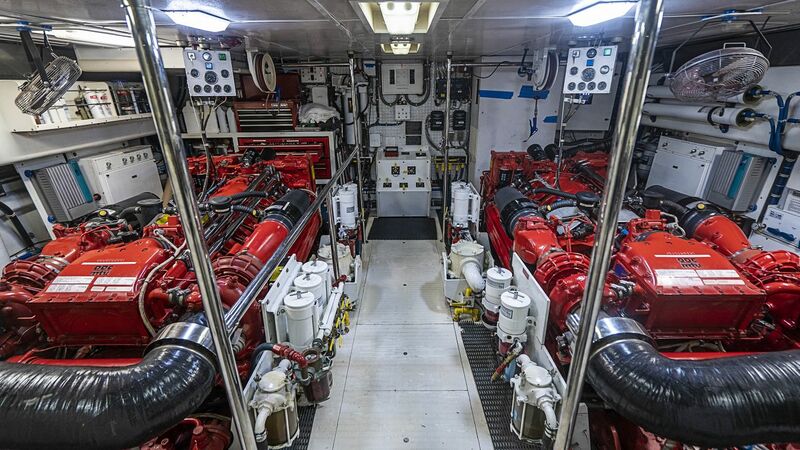 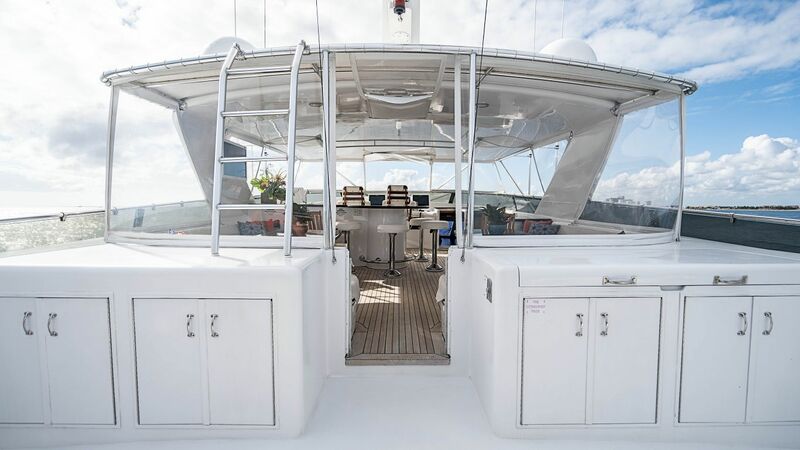 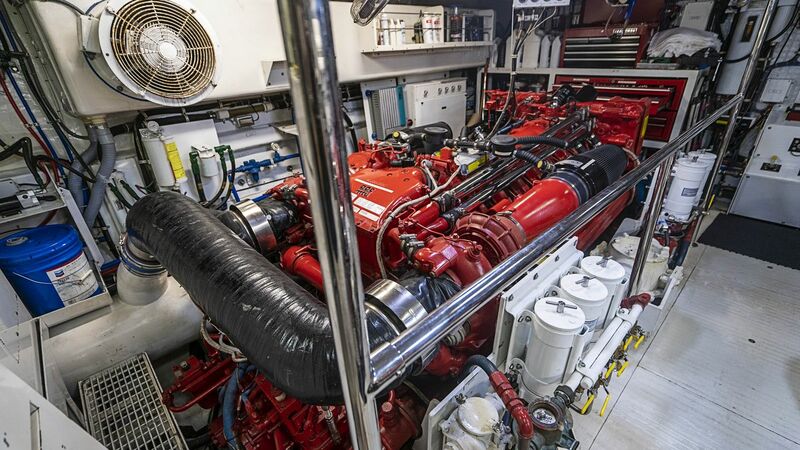 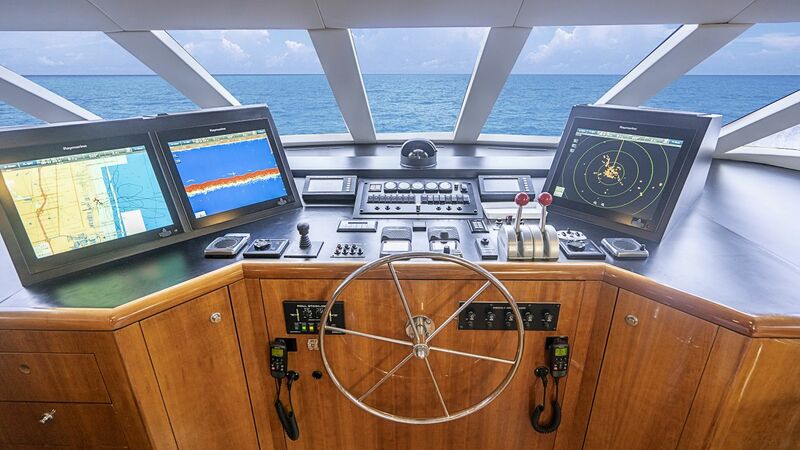 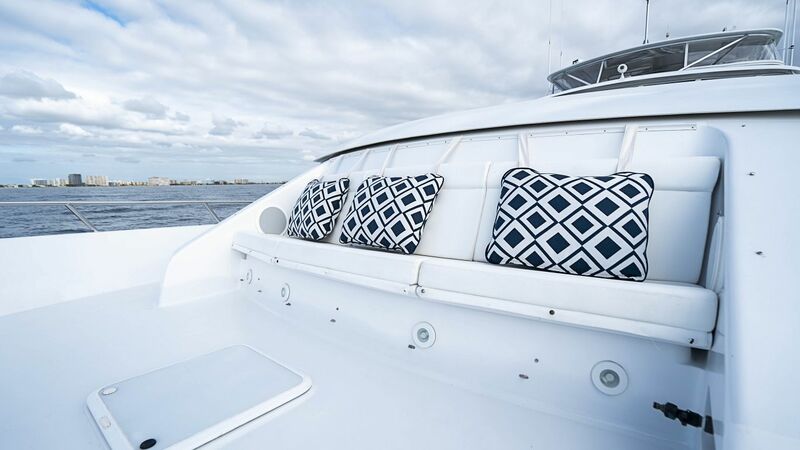 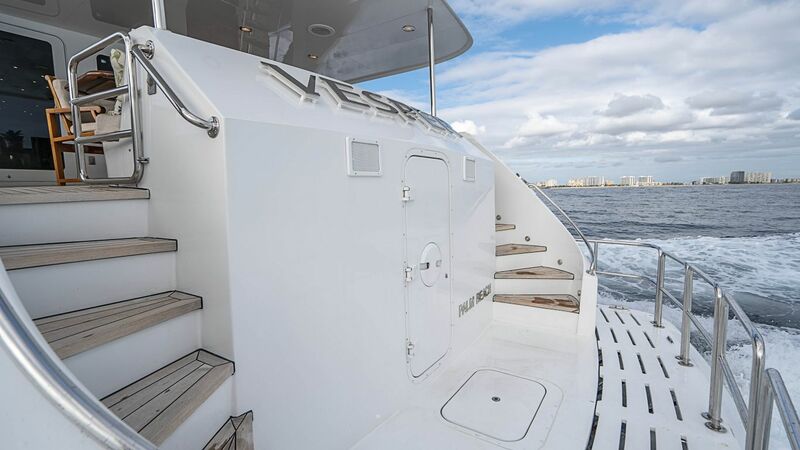 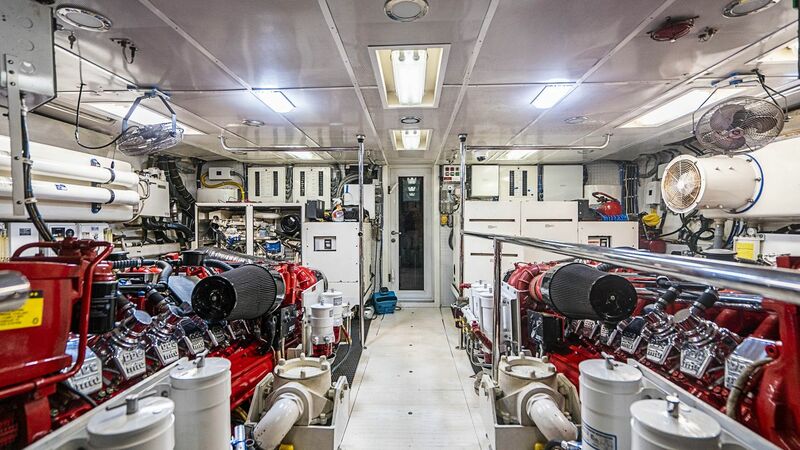 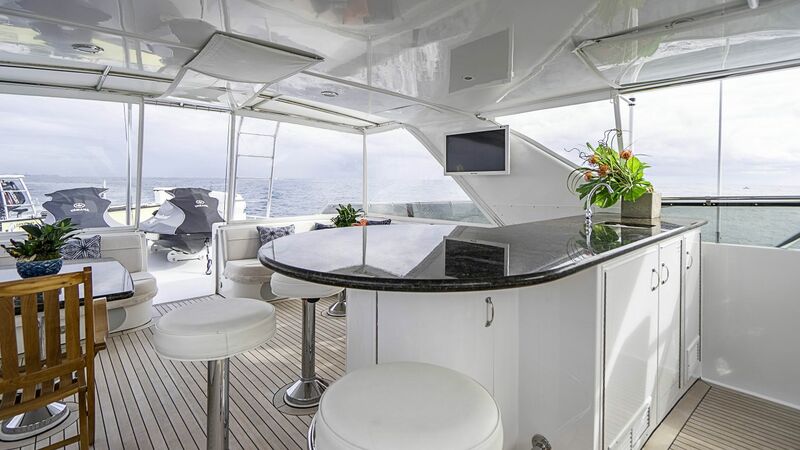 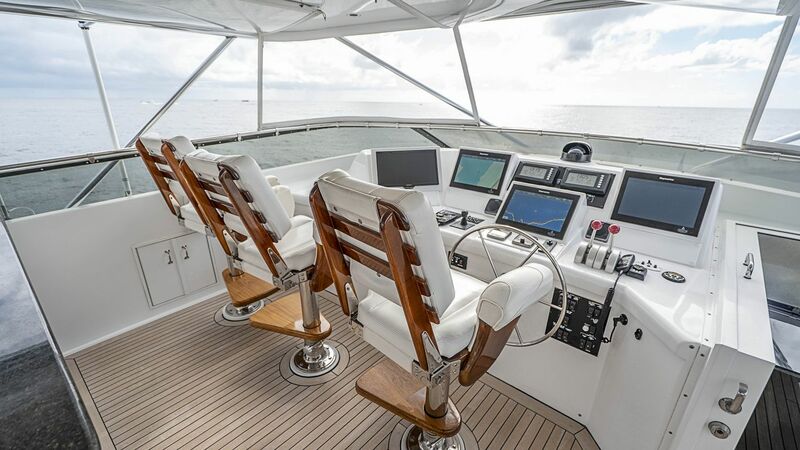 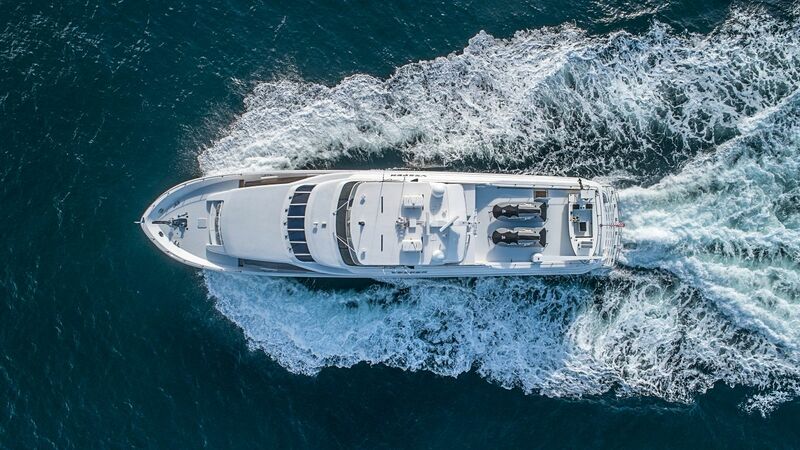 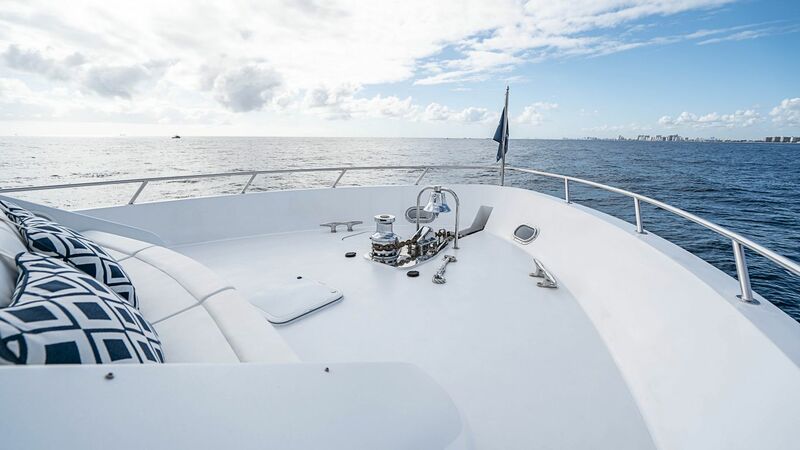 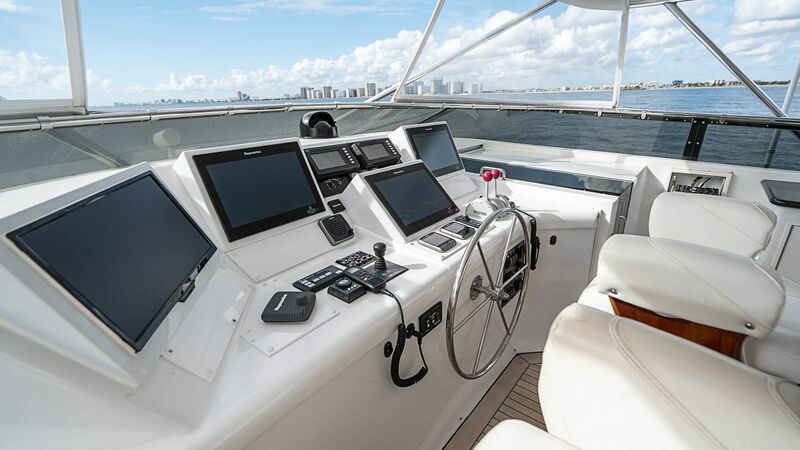 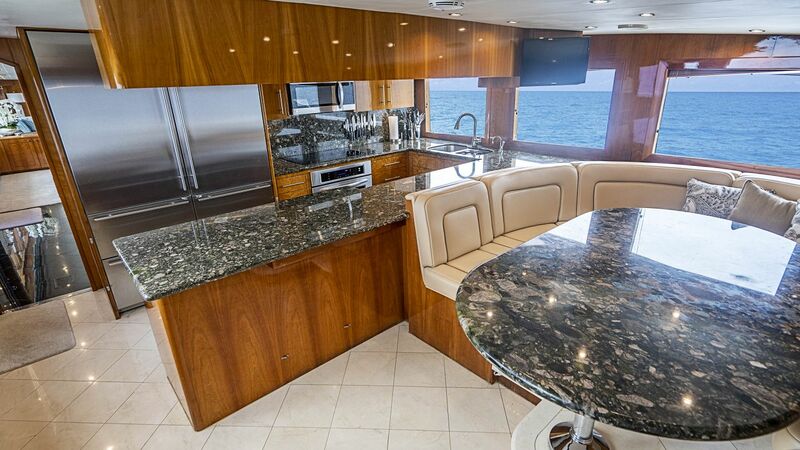 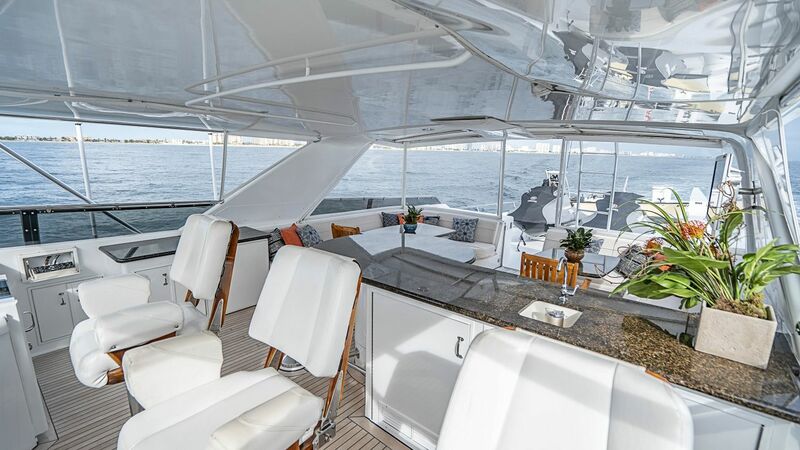 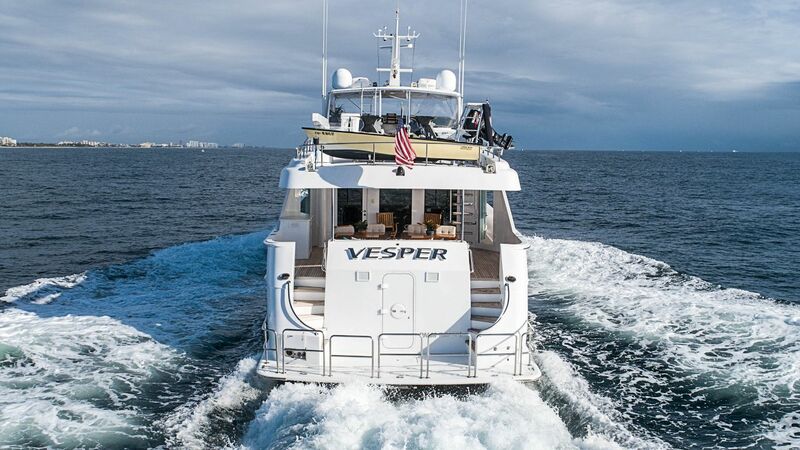 VESPER is a fine example of the well-equipped 100' Hatteras Flybridge Motoryacht, and had completed an interior refit with all new soft goods, Jan. 2018. 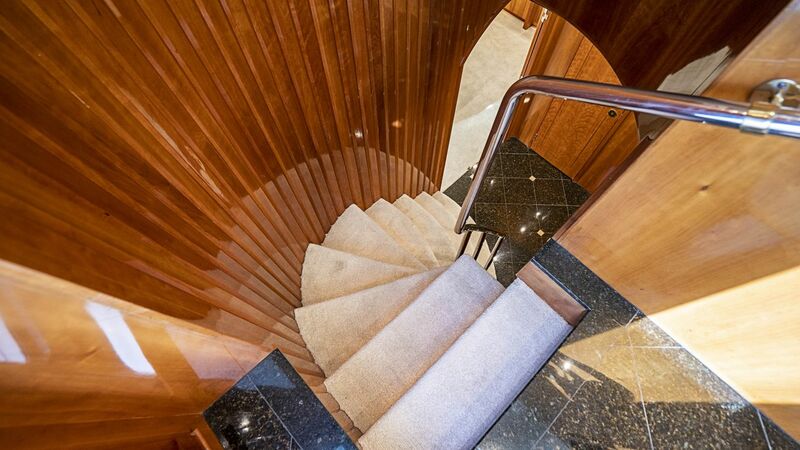 Upon entering the gorgeous main salon, you instantly notice her polished cherry joinery and extensive use of marble & granite throughout. 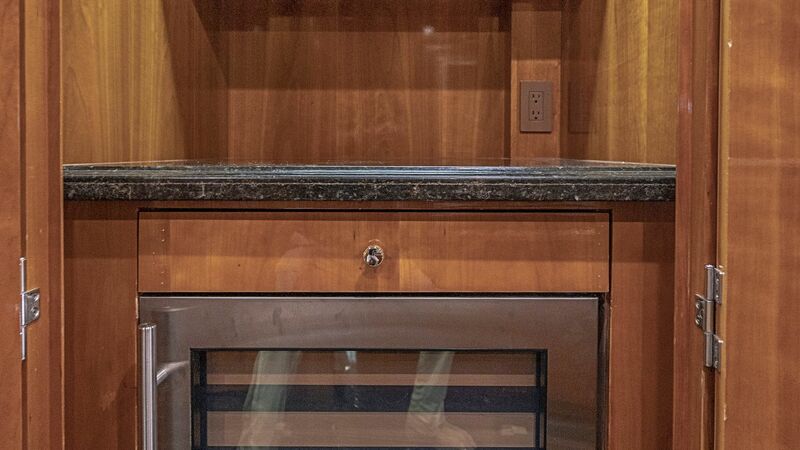 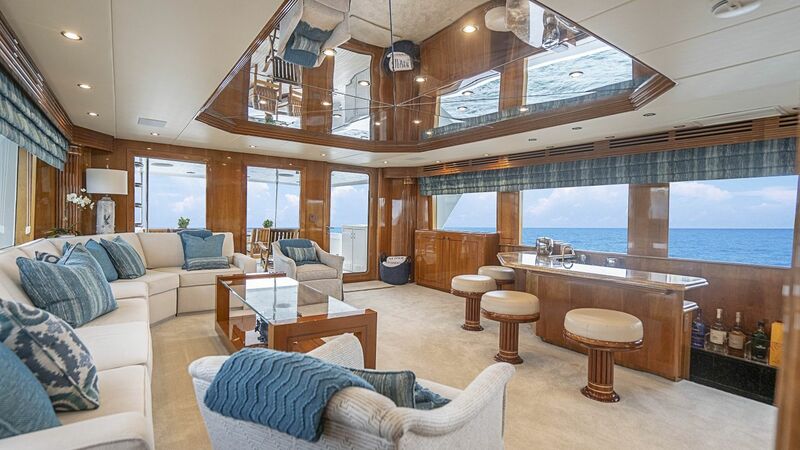 Featuring a plush L-shaped sofa, custom coffee table, built-in end table and two lounge chairs, with entertainment amenities to include a 46” TV, stereo/CD sound equipment, a sunken granite topped wet bar with icemaker and refrigerator. 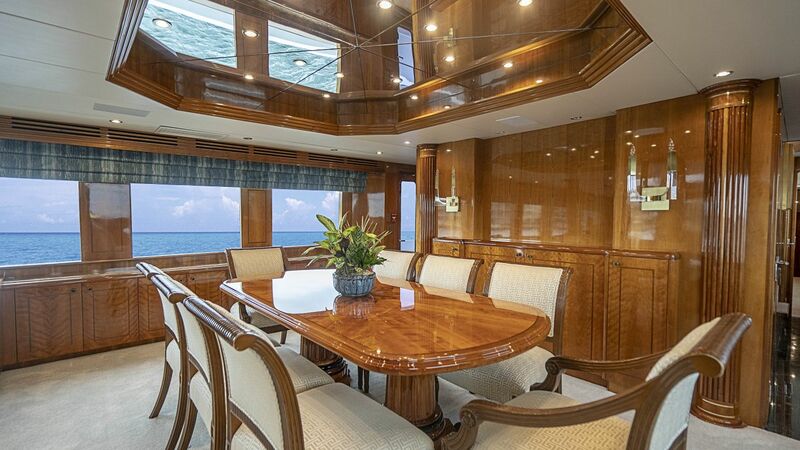 Her formal dining area for eight - all in her comfortable, large window-lined main salon. 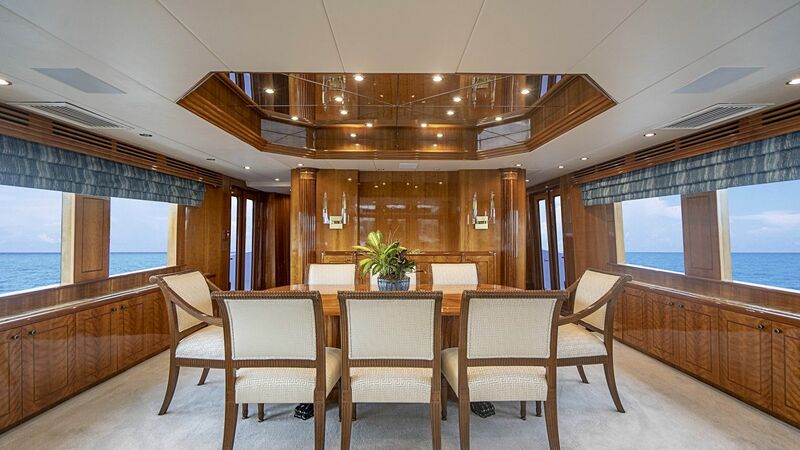 Entertain in style and comfort or adjust the dimmable lights and enjoy an intimate evening. 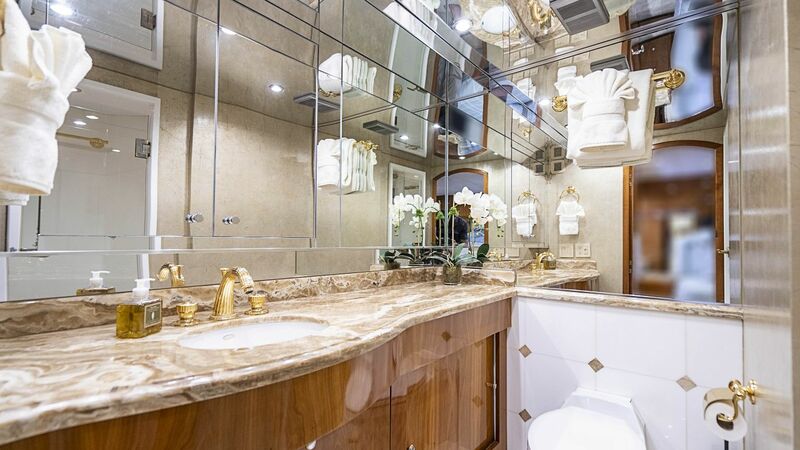 The convenient day head echoes the elegance of the salon with an arched doorway, marble flooring and rich cherry cabinetry. 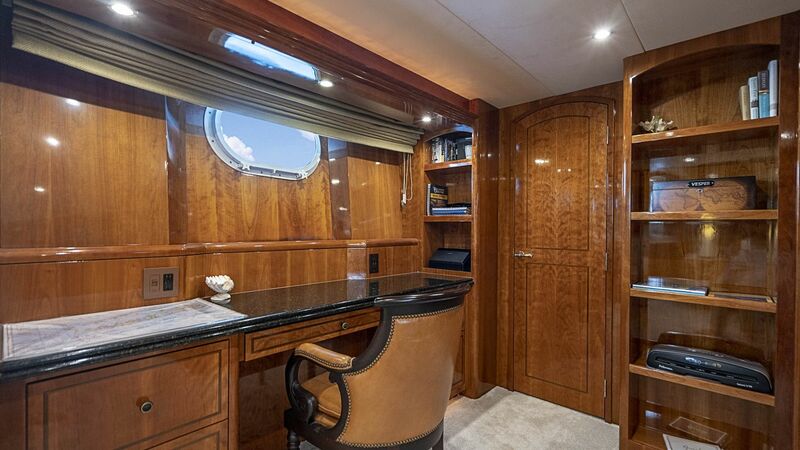 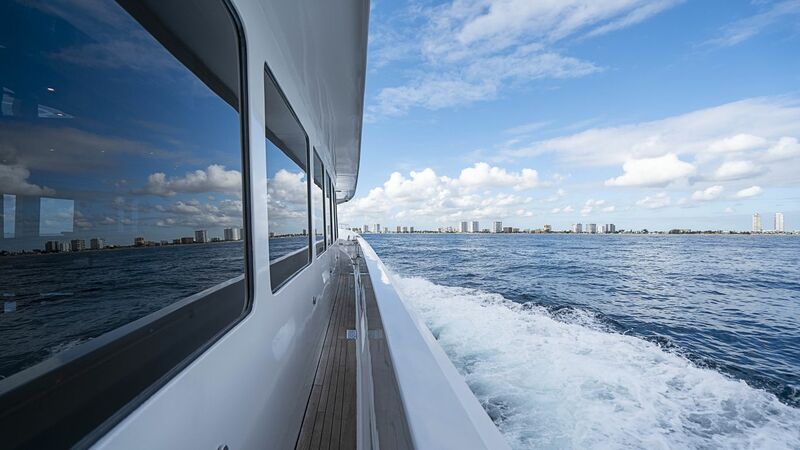 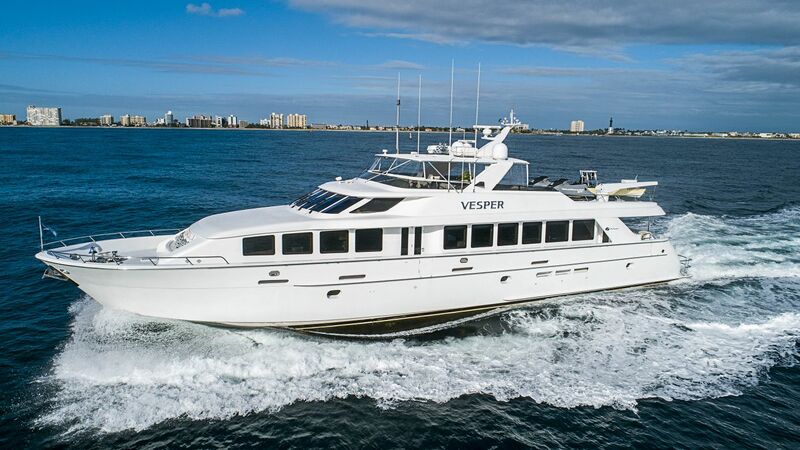 With accommodations for (8), VESPER features an elegant full beam master stateroom. 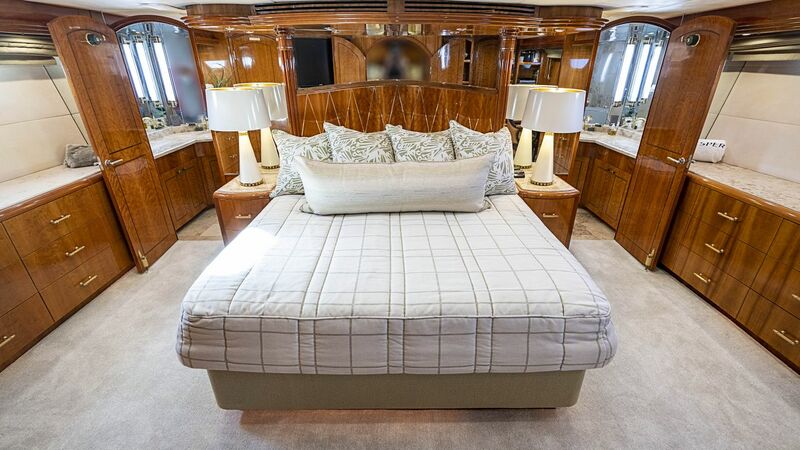 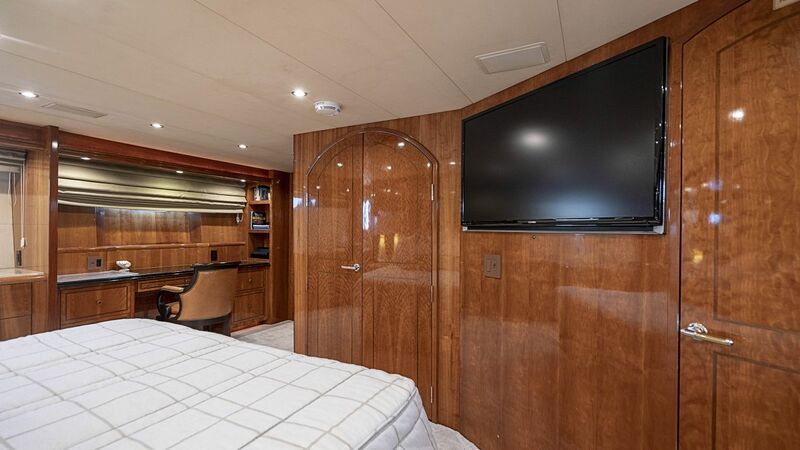 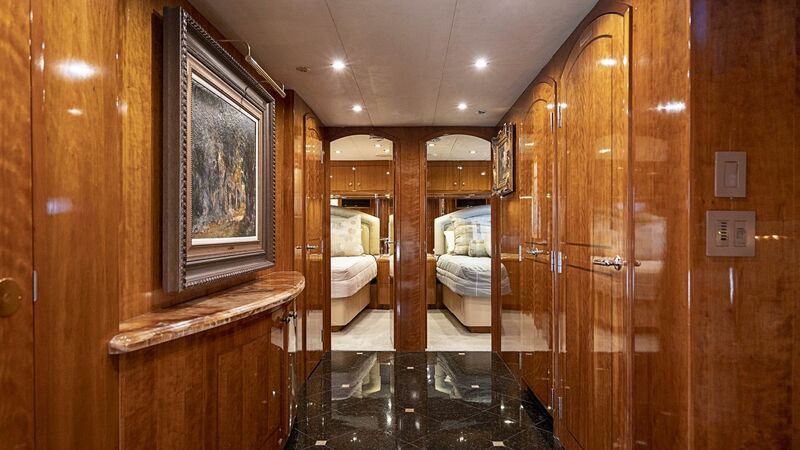 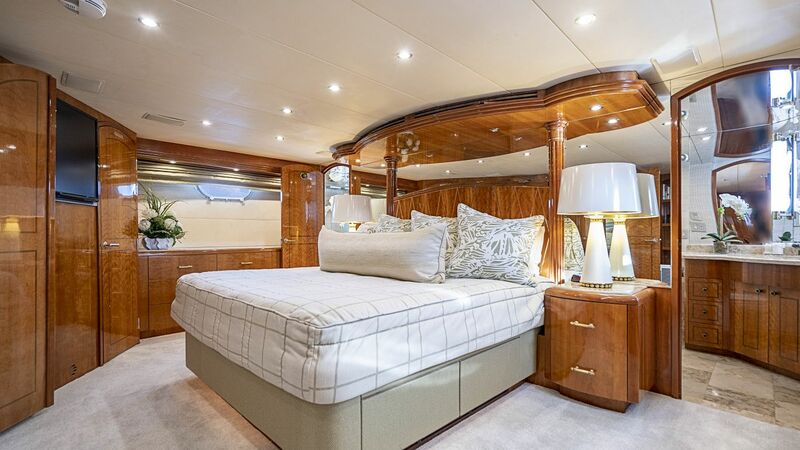 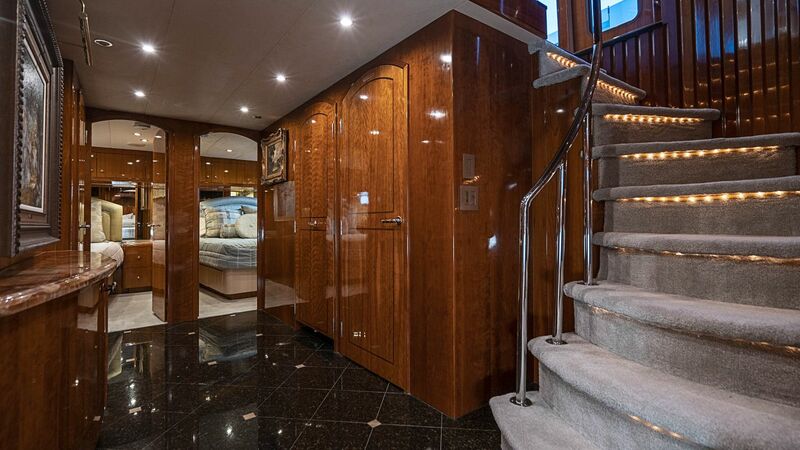 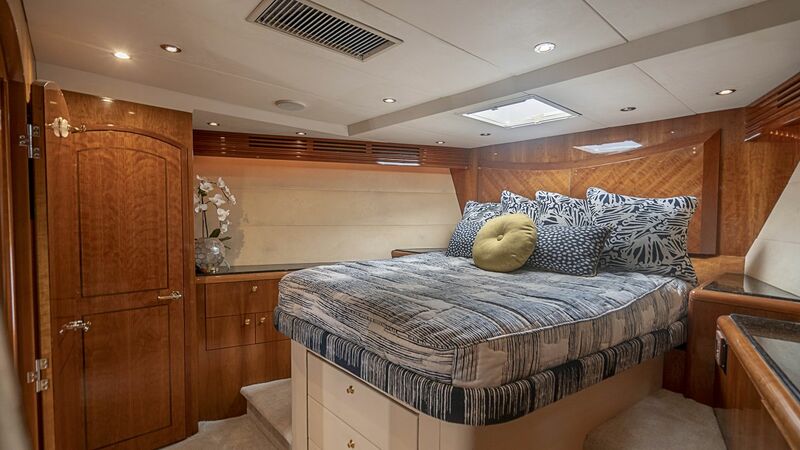 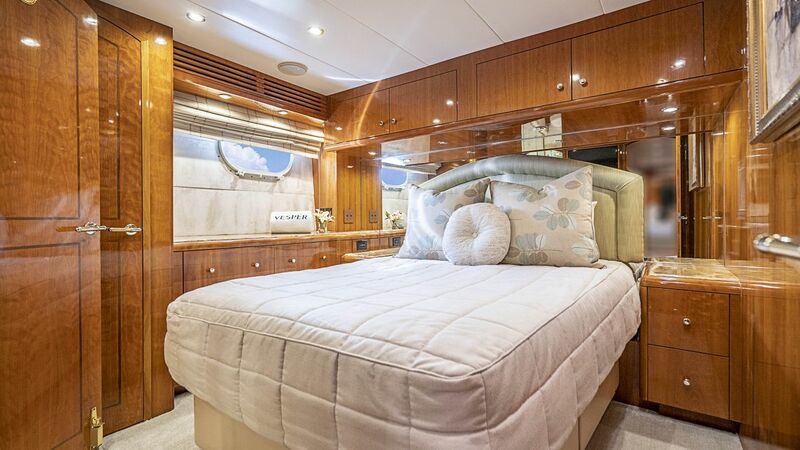 This luxurious master suite includes a king-size berth, port and starboard walk-in cedar lined hanging closets, wood paneling and crown molding. 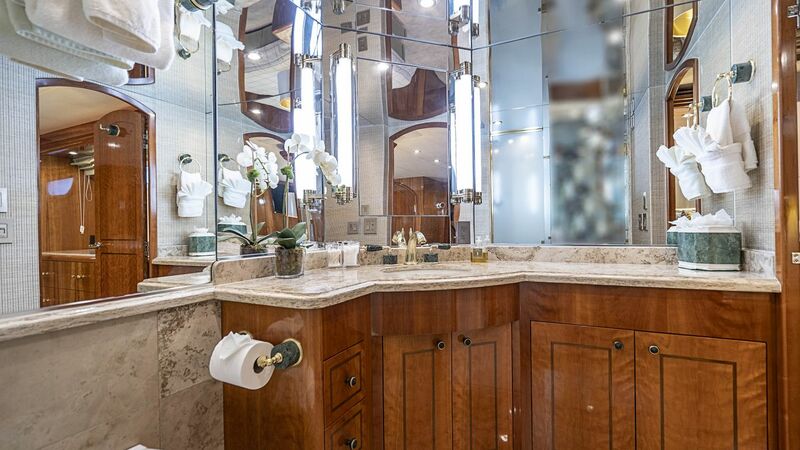 The master his/her bath boasts finished wood cherry cabinetry, marble countertops, oversized marble shower and his/her vanities. 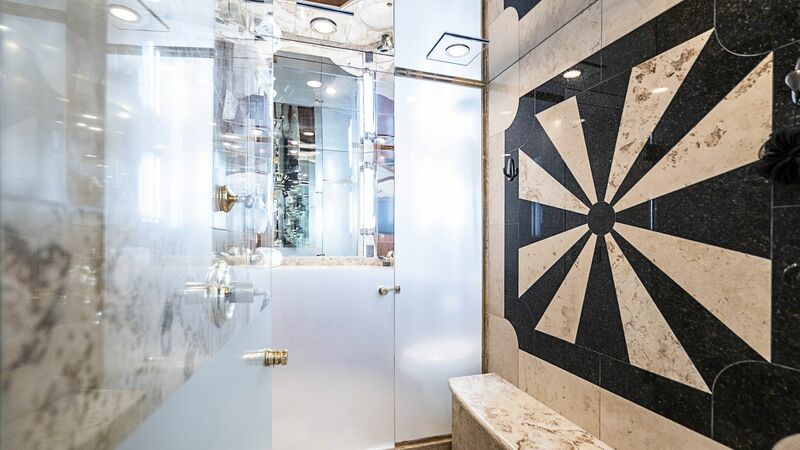 A luxurious VIP Queen stateroom forward, with matching Queen staterooms below - one is convertible and boasts a private Jacuzzi bath. 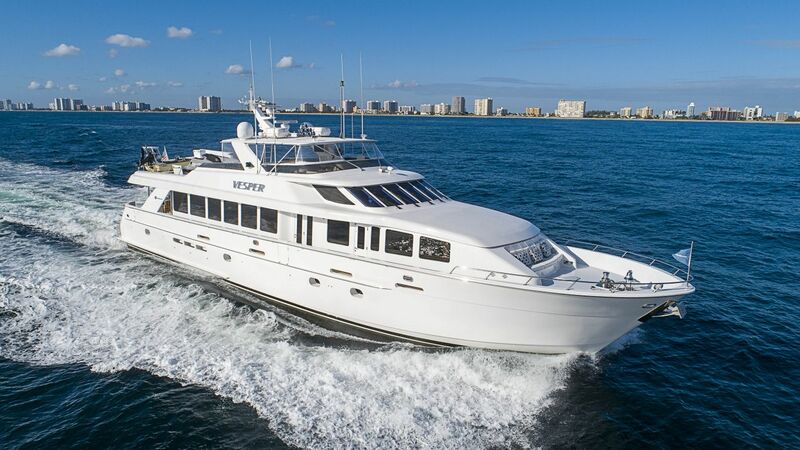 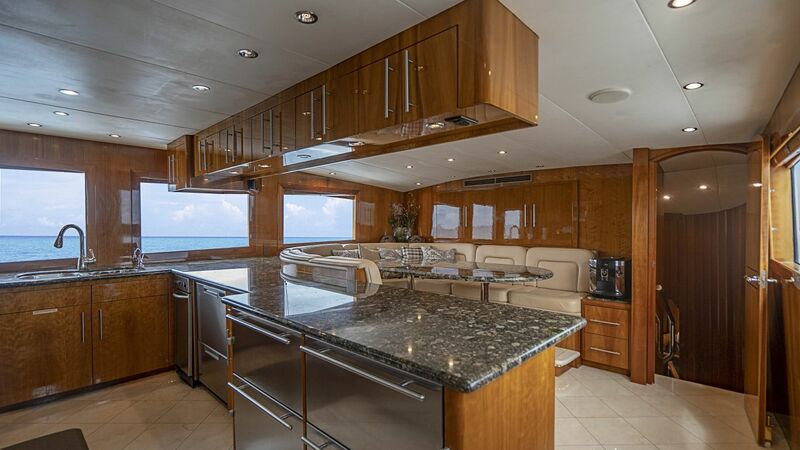 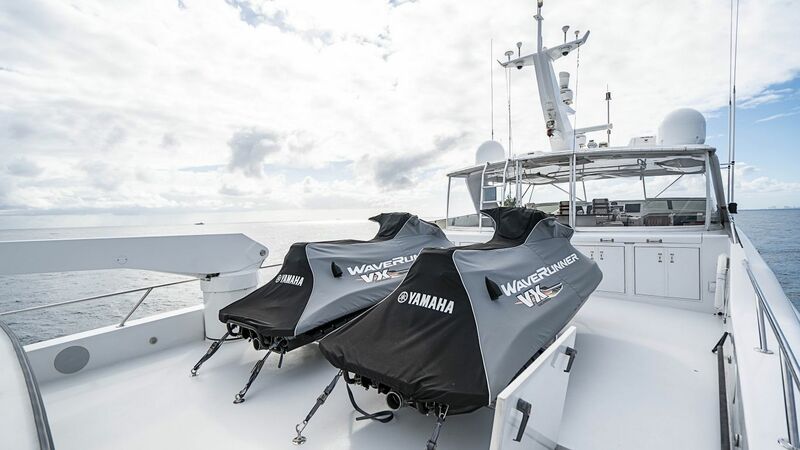 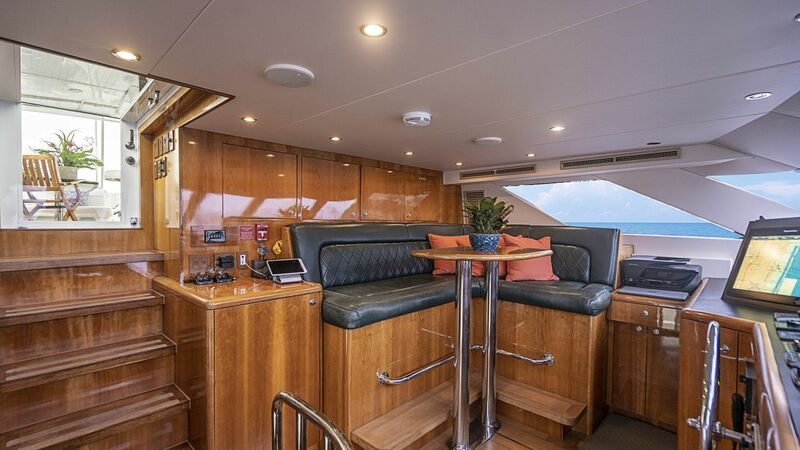 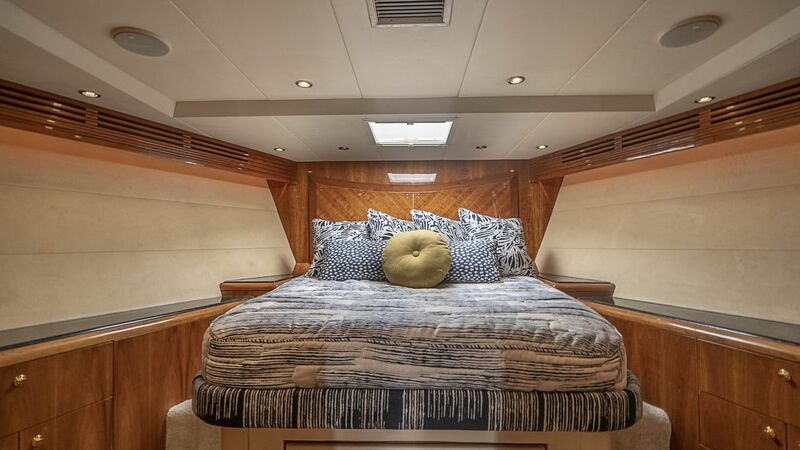 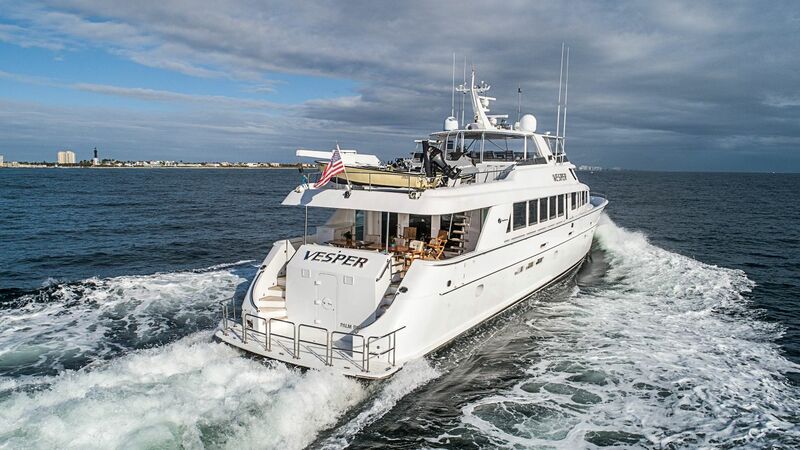 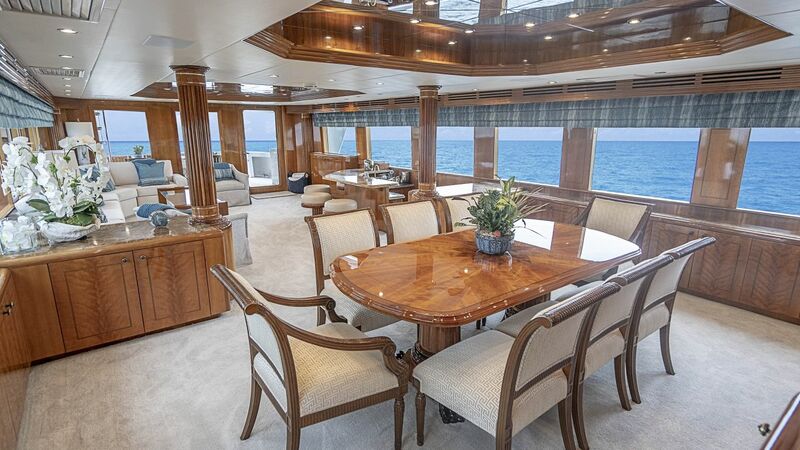 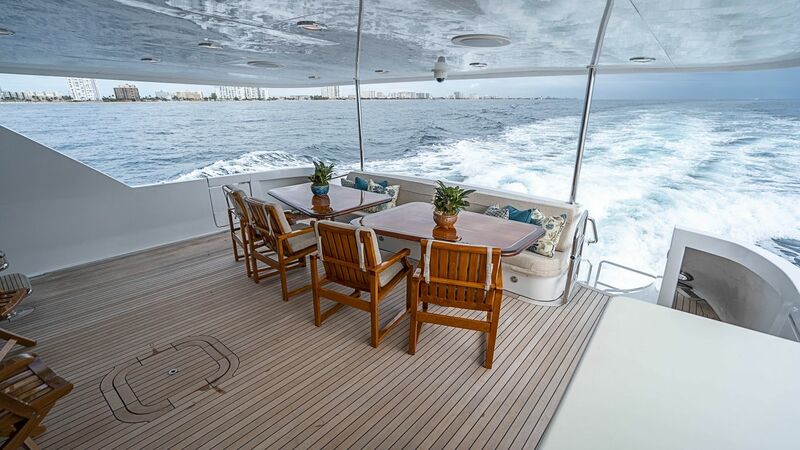 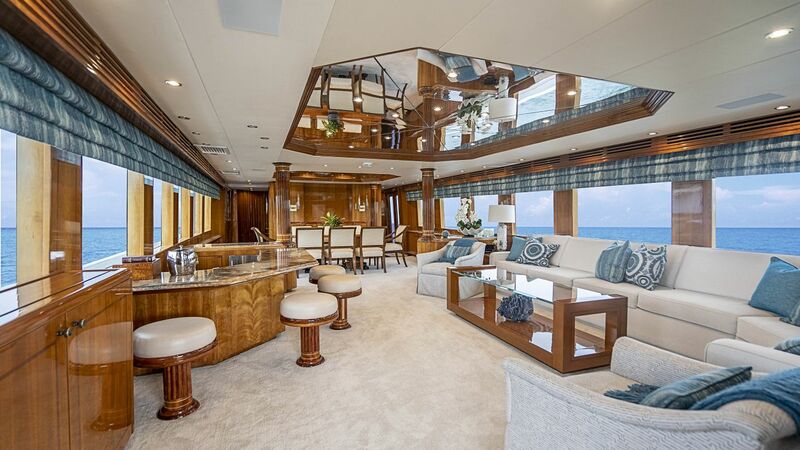 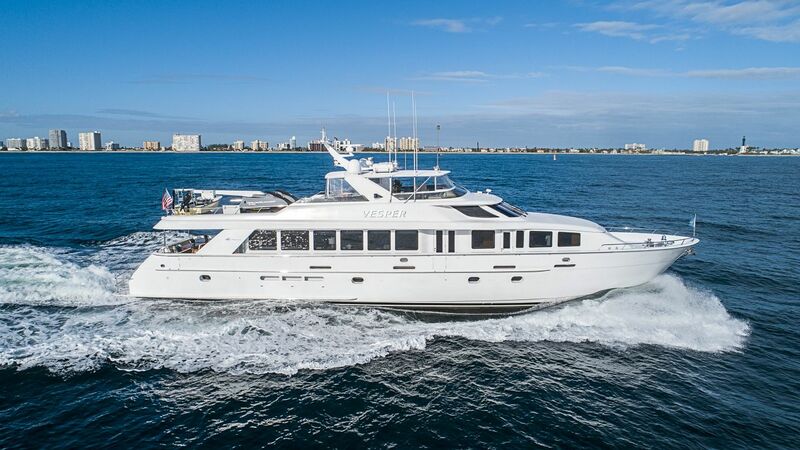 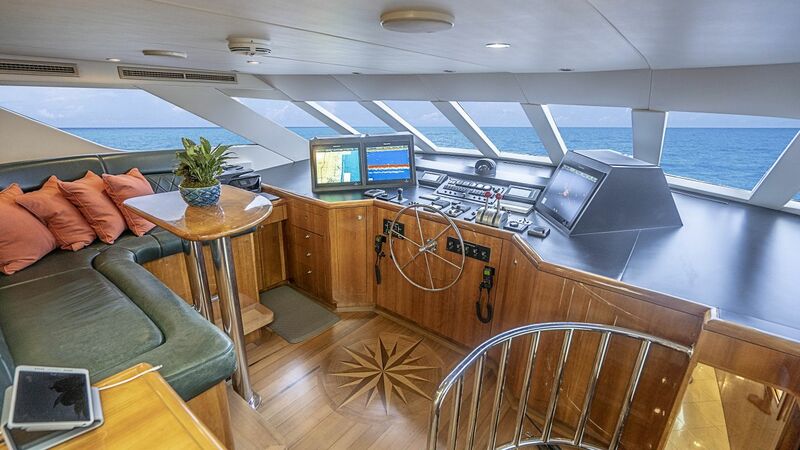 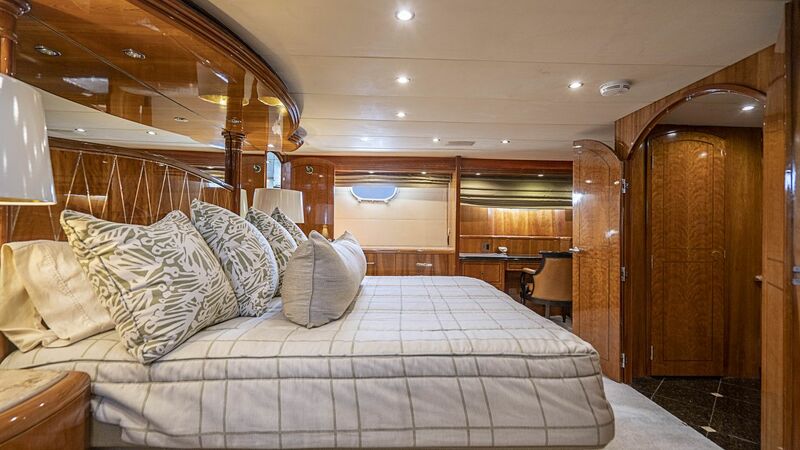 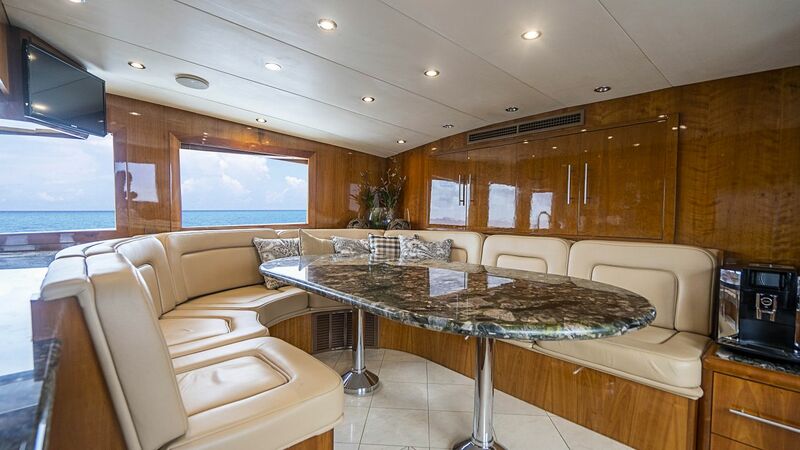 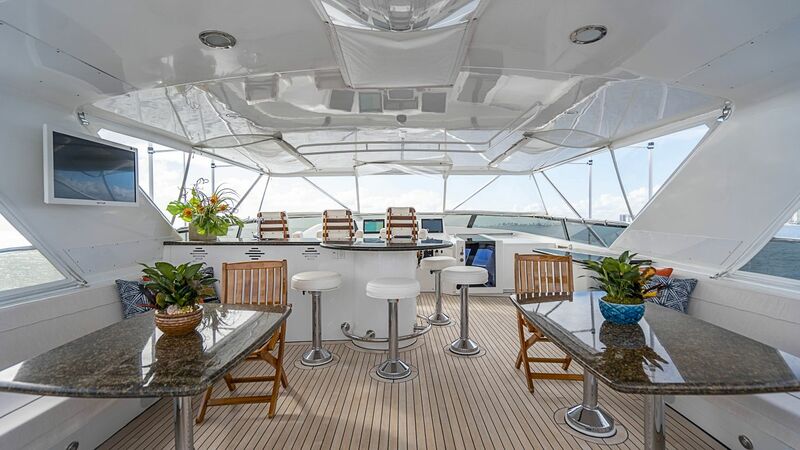 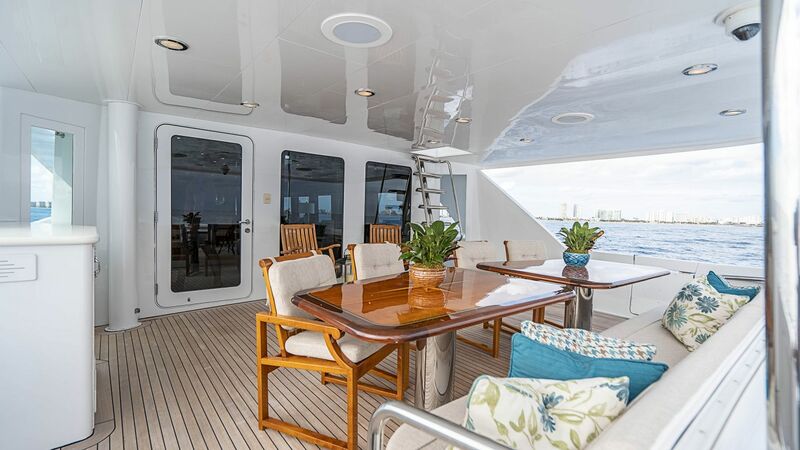 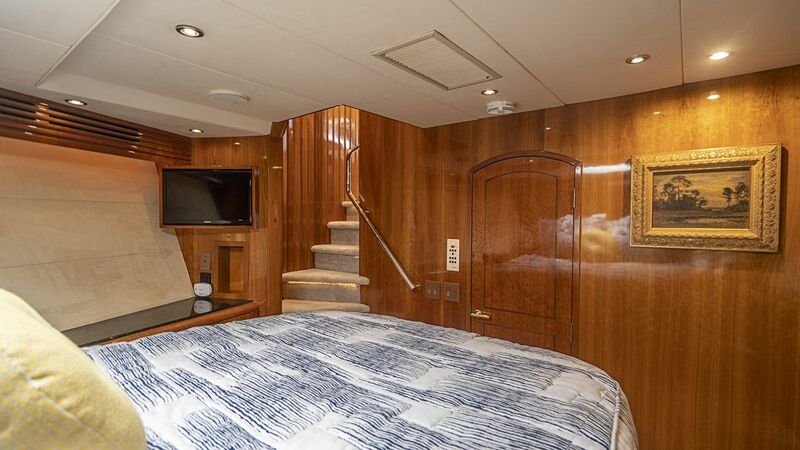 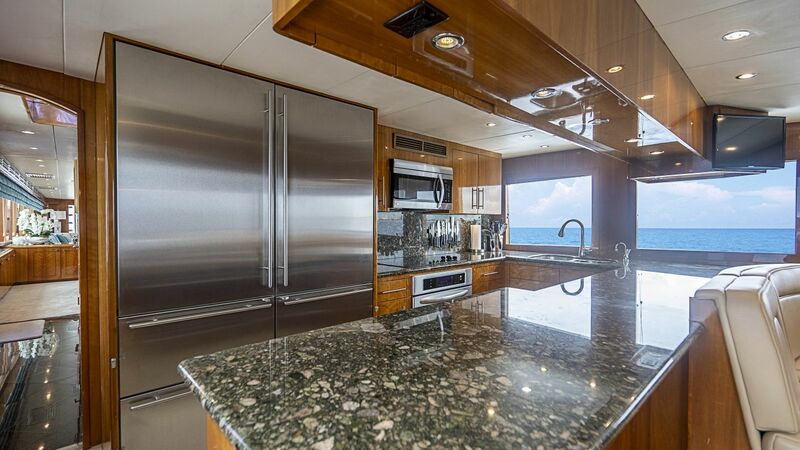 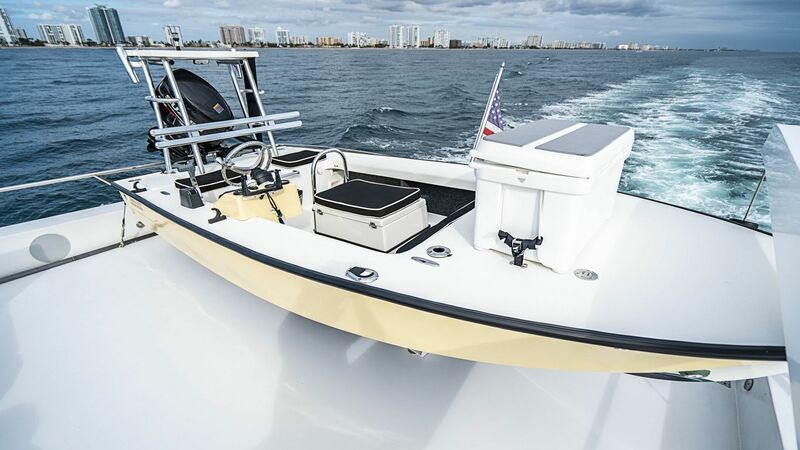 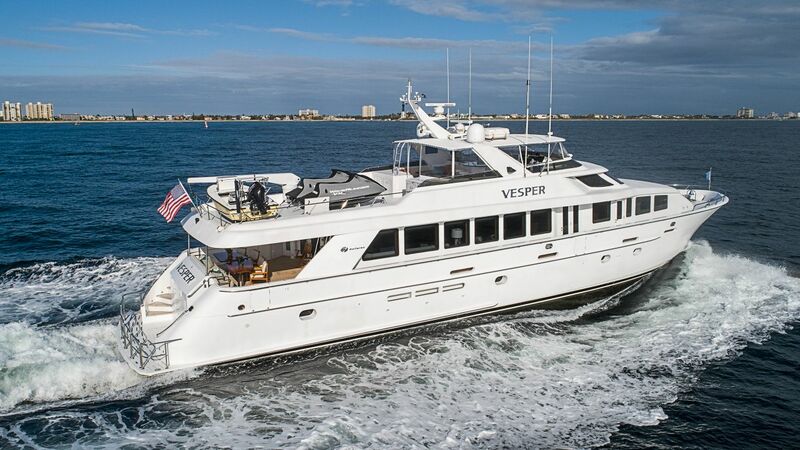 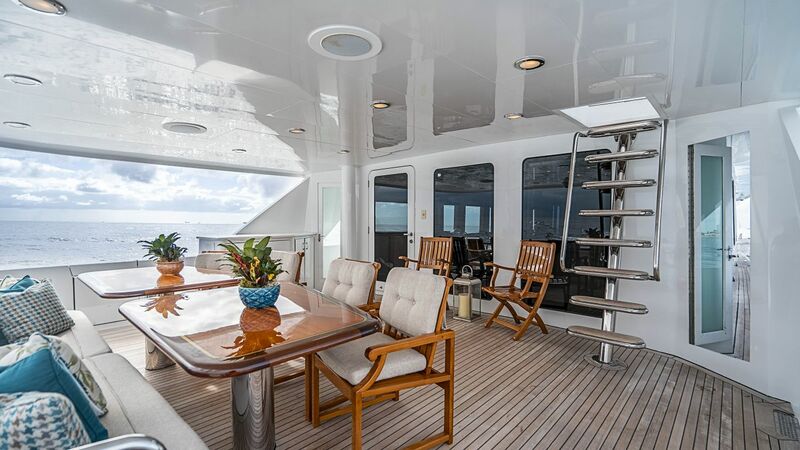 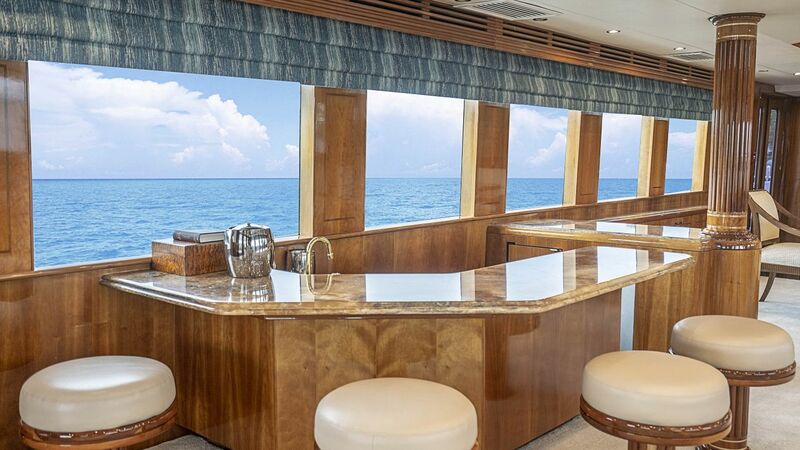 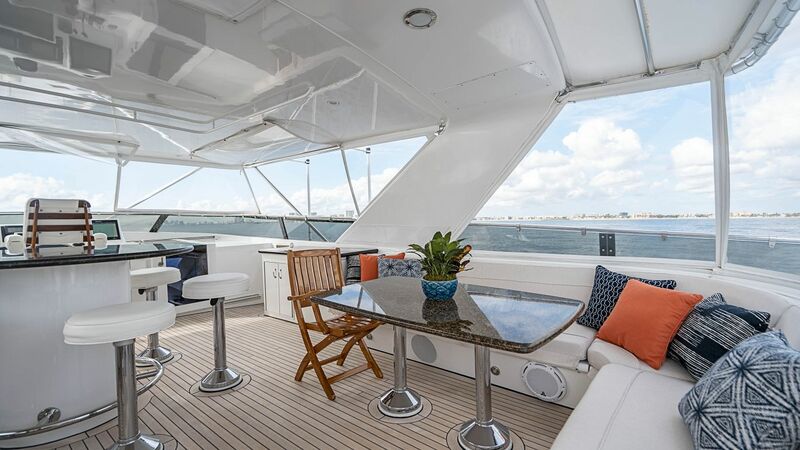 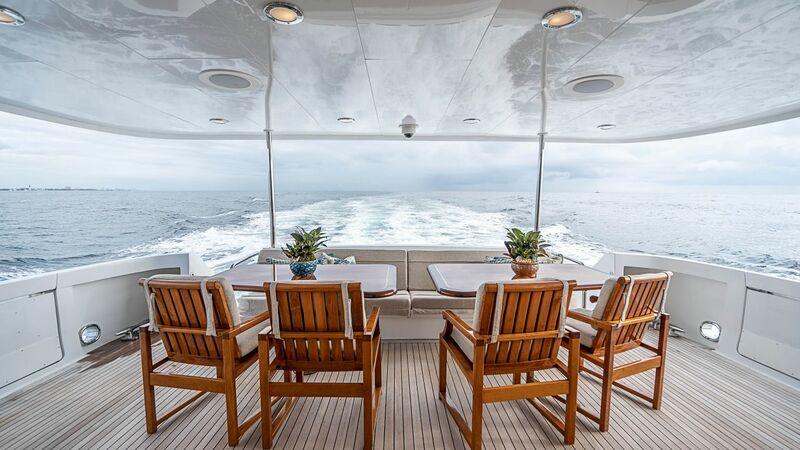 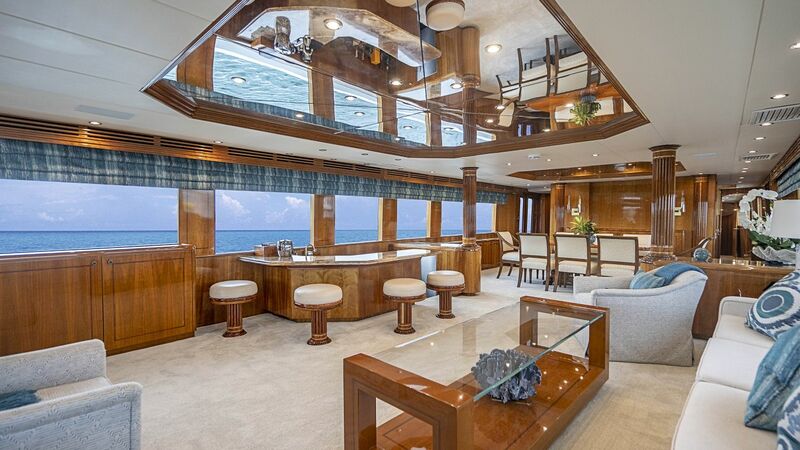 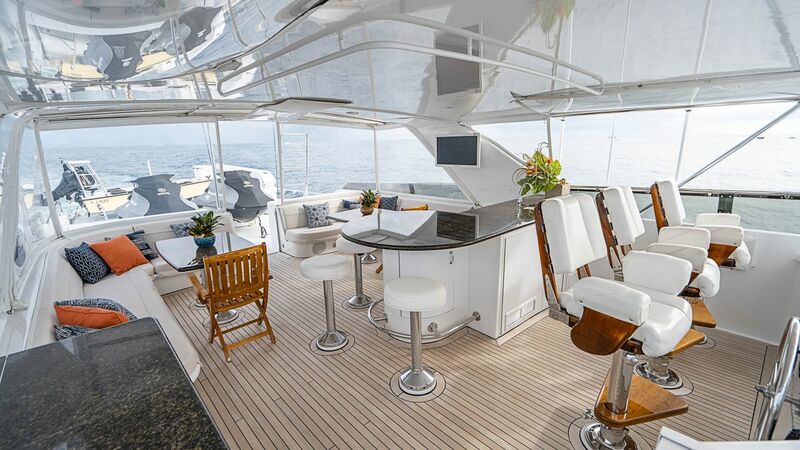 VESPER accommodates 8 guests in 4 guest staterooms. 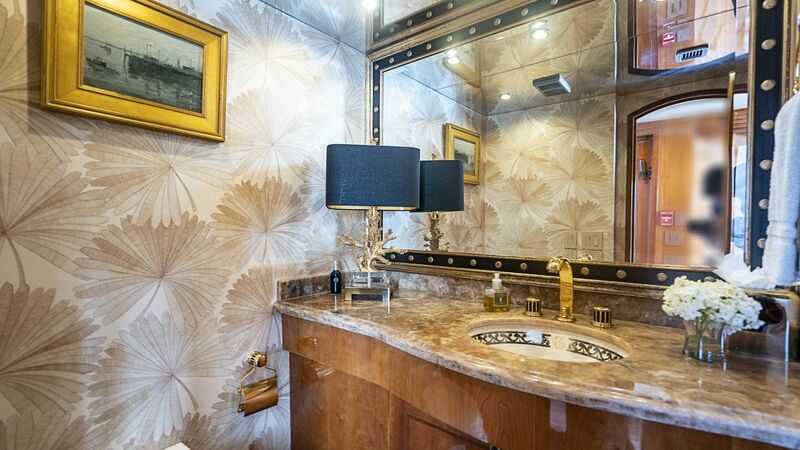 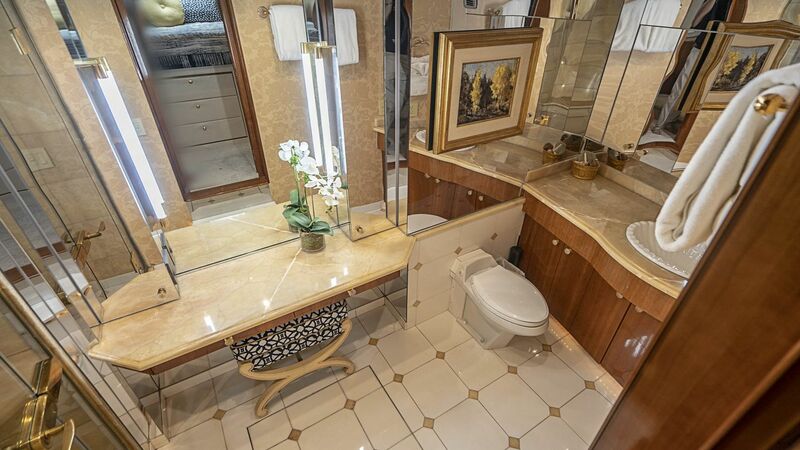 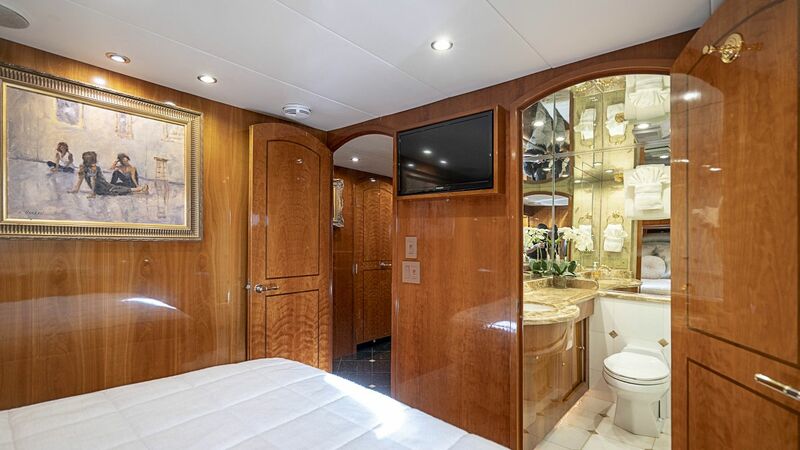 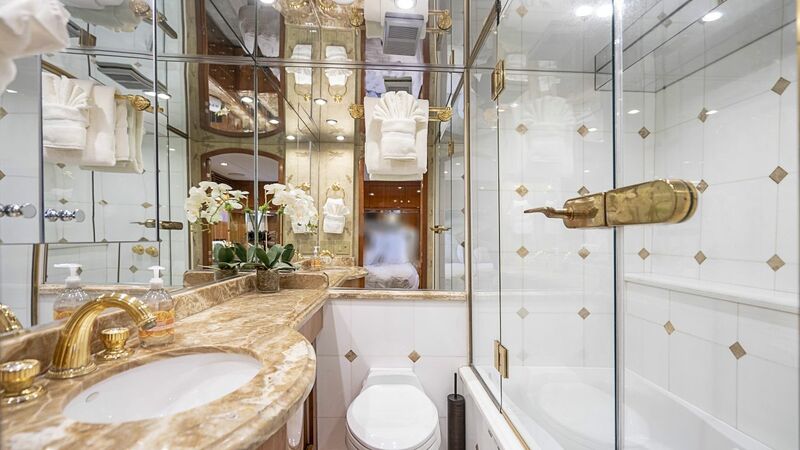 Master stateroom has an ensuite His /Hers bath with walk in closets and full entertainment system. 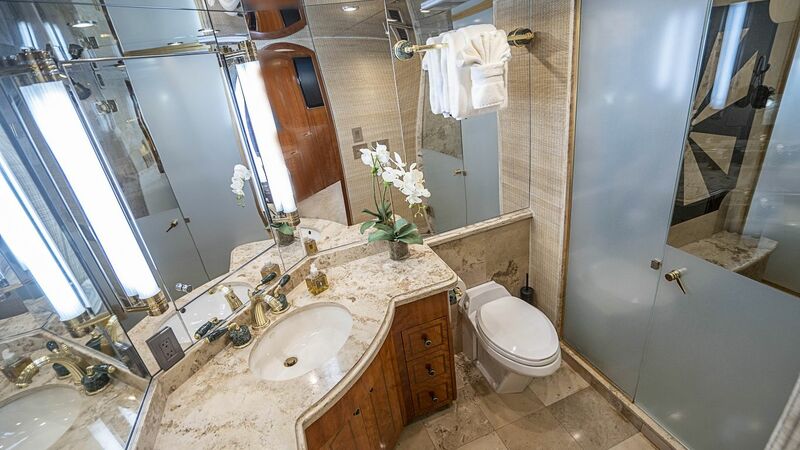 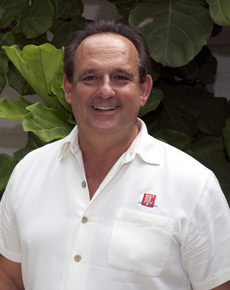 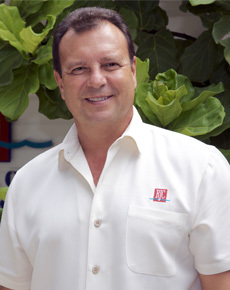 VIP Queen Guest stateroom is forward with an en suite bath with large shower. 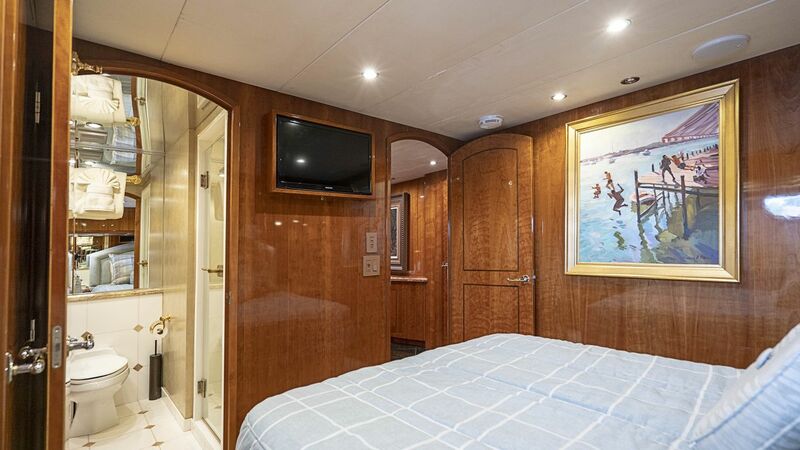 (2) Queen Guest staterooms have en suite bath with showers. 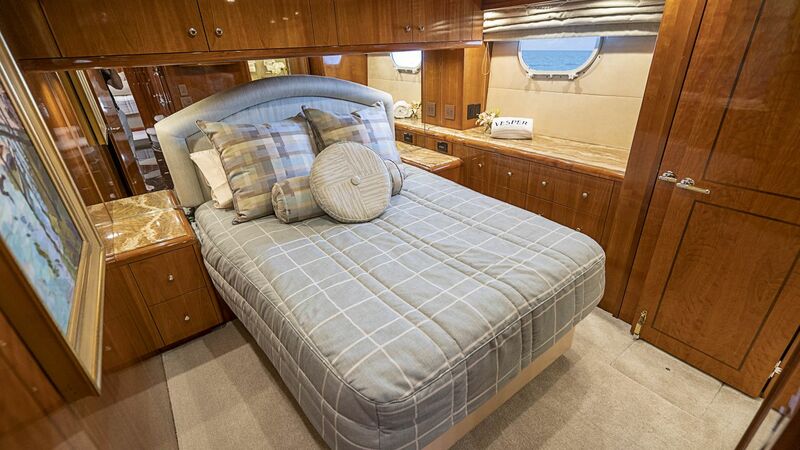 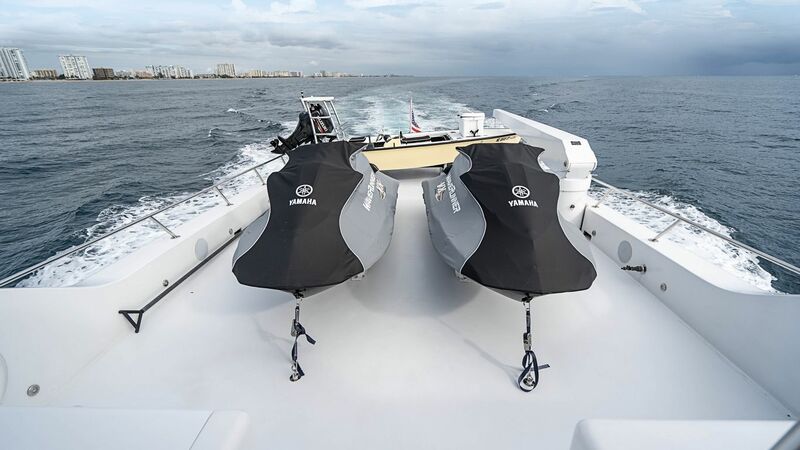 The queen bed, starboard converts into (2) twin beds.